Five days has passed since I attacked that outpost and saved those Tarkatans, nothing much has changes. Now Mileena and Tanya has agreed to train me during their free time. I really appreciate of this, because I'm not as fast as they are, but still, both of them approves my tactics. And I also founds that tarkatans feed on almost everything, meat mostly, fishes, birds, crocodiles, lizards, snakes, you name it, they eat it. I also feed on something, but instead of all the kinds of animals, I eat MREs that I brought, and some wildlife, such as small animals and stuffs. I also eats lizards and snakes, but I like birds the most. The satelite that were tracks the movements of Earthrealm Rangers on the Red Zone now tracks Sareena, who were reassigned by D'Vorah into the Earthrealm Intelligence Agency for an undercover assignment. "So how do I look?" asks Sareena. "Like on of the bad guys" said D'Vorah. 'Perfect for your undercover assignment"
"So Tanya is the prize" Sareena said. "Tanya's no prize, she's a whore. A mad dog killer for the highest bidder. Just remember your new identity, it'll keep you alive" D'Vorah said. Now the EIA database shows a logo of the Kombat Force 141 as D'Vorah adds. "Welcome to the 141. Best handpicked group of warriors on the realms"
"It's an honor, ma'am. When do I meet the rest of the team?" said Sareena. "They're on a mission recovering a downed ACS module behind enemy lines" said D'Vorah. "Their feet wet?" asks Sareena. I stand before my house, after a long and cold journey through the air. I arrived here at 17:38, close to midnight. I prepare myself, and hope that my fierce guest doesn't strike me because she's startled. I take my house key, and unlock the door. I stick to the wall as I slowly open the door. The door creaks as it opens wider and wider, I thought for myself "I should really put some oil right there". The light's on, and I can clearly see, that nobody is in the living room. I to inspect the kitchen just to find nothing but some empty cans of food and drinks. And now, only one room within the vicinity of my house that isn't forbidden I haven't check, and it's my own room. I once again stick to the wall as I open the door, and yet, when I check inside, there's no one inside. Sweat streaming down my face as I keep my body from moving. I breath so slowly I don't even know if I am breathing. I keep ducking behind a bush, trying not to make myself noticed by the creature. My fingers hold the string of my makeshift bow as I steady my aim, targeting at the creature's heart. The creature turn it's face to me, and at that very moment, I release my arrow to shoot it. The creature that is actually a small deer killed instantly after I shot it. "Alright, got quite a game today. Thank you for your contribution of meat and leather, deer. Your service will be honored" I said to amuse myself before I took the arrow from the deer and put it back to my quiver that I made several days ago from a quite large bamboo trunk. Then I take the deer to my shoulder, and start to walk through the jungle. Voices of peoples interacting with each other heard outside my humble house. And those voices also, is what wakes me up from my nap. I felt so rested and well prepared for everything as I get up from the couch I've slept on. I stretch my body a bit before I check on the time on my watch, it's now 16:24. I decide to clean my face a bit after the firefight just quite a while ago. I also make a cup of tea, like a British, though I'm not a British and I don't know what the tradition of drinking tea in the evening. As I sip my warm tea, I remembered about my wounded guest. I have slept for a wile, so I suppose she should be awake now, or not. Either way, I take a vial of penicillin and two syringes from my first aid box. And I directly walk to my room where the guest is after I put my empty cup of tea on the wash stand. Mirror Alex: The hell are you? Alex: You're me, I guess? Mirror Alex: Are you my clone? Mirror Alex: Let's see how good am I.
Brenda: So, long time no see, am I right? Alex: Miss Brenda. You're still alive? Brenda: Still after that empress? Alex: She'll brought peace for both of the worlds. Brenda: You should fought for Earthrealm! Alex: I did. But in my own way. Brenda: Know, that your way's going to get you killed. Thalia: Plotting to murder the Kahn? Alex: Yes. And for you too if you stands in my way. Thalia: I will bring my emperor your heart! Alex: The false Kahn's lap dog. Thalia: One more of Mileena's little friend. Alex: My mistress wants your head. Rosalie: Do not enter the emperor's territory! Alex: Why? Are you gonna kill me? Rosalie: That's exactly what I'm gonna do! Alex: You're quite a beauty, did you know? Earthrealm satelites shows the aerial video feed of several vehicles making way through a desert area, heading towards a town. As they approach that town, the computer creates a 3D image of the vehicle. The computer starts to analyze the vehicles and the weapons. As the convoy moves closer, D'Vorah starts the speech to encourage the soldiers, "We are the most powerful military force in the history of realms. Every fight is our fight, because what happens over here matters over there. We don't get to sit one out." Those vehicles are several M1026 HMMWV with a newly fitted M134 minigun, an M104 'Wolverine' Bridgelayer, an M1A2 'Abrams' tank, and several IAV 'Stryker' with 80mm Anti-tank turret. "Learning to use the tool of Modern Kombat is the difference between the prospering of your people, and utter destruction"
The computer now shows the bridgelayer opening the bridge it brought and put it on a trench, the computer shows the bridge that could span to the length of 24 meters. KoD: MK - Part 1 - S.S.D.D. Up above the skies of the vast land of Outworld, a satelite, launched by Outworld rebellion with the help of Red Dragon before the second Outworld civil war, floating within the area where there is almost no gravity and completely no air. It's now has been taken by the Outworlders to help their cause after their victory in the second Outworld civil war. D'Vorah, the Kytinn queen, now has joins with Earthrealm Rangers with a rank equal to Lieutenant General. As the video feed from the satelite shows the vast desert land of Outworld, D'Vorah starts her speech. "The more things change, the more they stay the same. Boundaries shift, new player step in. But power always finds a place to rest it's head". 1). When she is picked, Dullahan walks while leaving a trail of cold smoke coming out of her mask. 2). When her variation is picked, Dullahan will create a ball of ice and then break it. 3). When both characters are ready. she turns around and walks while leaving a trail of cold smoke of her mask. Rules: Pick a song for your OC's opening and ending theme as if they are a series, it can be any song from a movie, band, singer, shows, does not matter, and when you done tag one or more people to play along! GOOD LUCK! 3. Post their names along with their creators' avatar. 1. He is a 1-st Class Sergeant of the UNEASEC and are in charge of a squad of 15, his squad's name is Venom. 2. Though he's working with Mileena and her rebel, he isn't completely with her. Unlike Rain who wants the throne and Tanya who wants her home back, Alex wants to put Outworld and Earthrealm into alliance, so there will be no more wars in the future (how did he know? Well, there's kombatpedia). He is simply a volunteer for Outworld rebel. 3. His first mission as a Private was to scout an Ultranationalist camp near Chernobyl NPP. 4. Though he could make some makeshift weapons and gears of his own, he usually asks for help from his engineer friends. 5. He can speak several languages, which is: English, Indonesian, and Russian (For combat only, not conversation). 6. The last time he does an IQ test was in High School. His score was 114. 7. He is one of several who got a golden opportunity to test the new UNEASEC's equipment. The Prototype of A.C.E M-14 E.X.S. 8. He doesn't like person who showing off too much. Rain and Kano for example. For him, it's better to conceal what we had so that we could give it an element of surprise when we need it. Just a student from the archipelago country of Indonesia, Borneo to be precise. 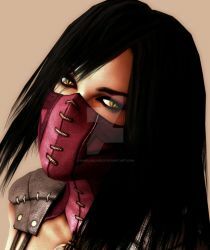 And have a crush with the blood sister of Kitana, Mileena. I'm not afraid to be different. Hello, how are you? It has been awhile. What have you been up to?